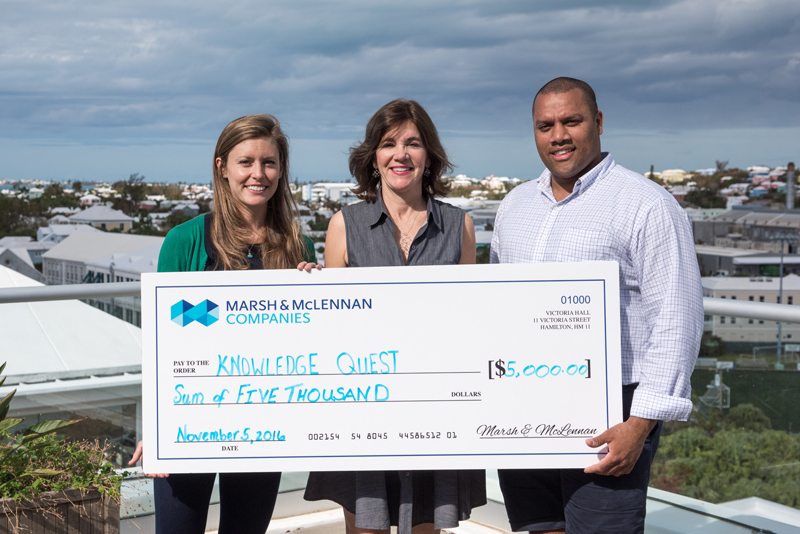 Marsh and Guy Carpenter have made a $5,000 donation to Knowledge Quest, which will help Knowledge Quest in its mission to provide scholarships for academically capable Bermudians in need of financial assistance. Knowledge Quest’s scholarships provide students with funding for college or university abroad. “There are so many academically talented Bermudian students who need financial aid to continue their education,” said Cynthia Cox, Director, Knowledge Quest. “It is for this reason that Knowledge Quest was started and over the past 15 years, we have relied on the generous contributions of donors, like Marsh and Guy Carpenter, to ensure the students receive the education they deserve. Knowledge Quest was founded in 2002 and has helped more than 160 people. Every year, approximately 12 new scholarships are awarded and in any given year, about 35 scholarships are paid for. “Everyone should have access to a tertiary education,” said Jill Husbands, Country Corporate Officer of Marsh & McLennan Companies, Bermuda and Chairman of MMC’s Bermuda Corporate Social Responsibility Committee. Students interested in applying for a scholarship can apply online at here before April 30, 2017. For more information about Knowledge Quest, visit www.knowledgequest.bm.